Texture Maker v2.4+ - Natural Rock Tutorial, by Tobias Reichert. We are going to create a texture that is a mixture of rock and moss. 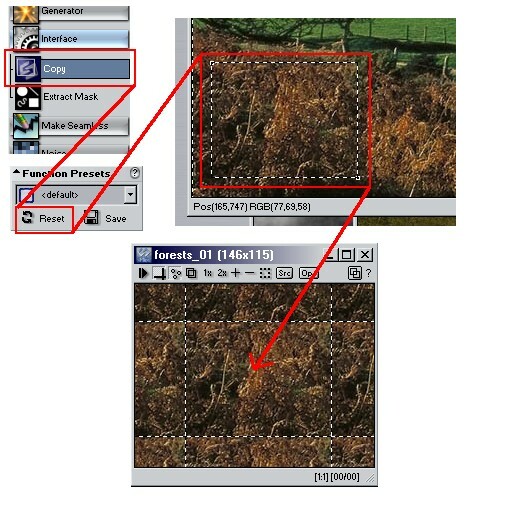 The two materials, rock and moss, are acquired from images that you either have already on your PC, or get from www.google.com (image search). You can also copy the images from this page and use them. 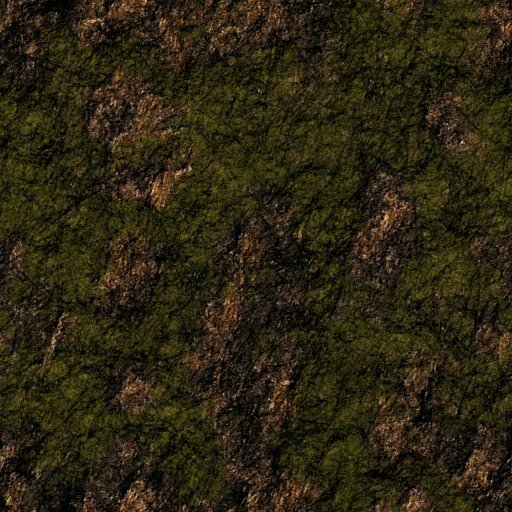 When you have the images, load the source for the moss material into Texture Maker. Now select the Interface/Copy function and load the default settings by pressing the reset button. Draw a rectangle around the region of interest. The region will be copied to a new texture window. This will be the texture that is used by the ISampler to synthesize a bigger, seamless one. Use a texture that is as homogeneous as possible (i.e. has no prominent features). 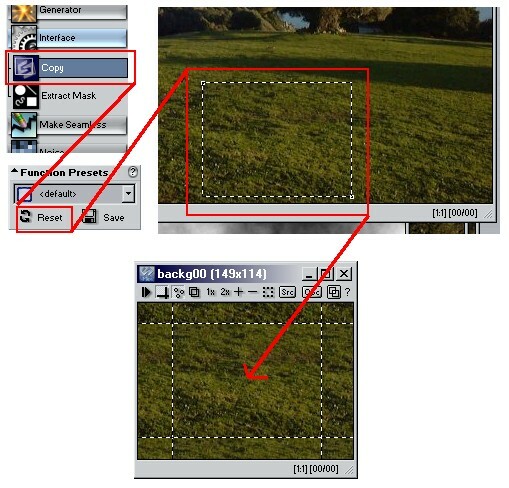 Click on the empty thumbnail image in the Source section and choose Texture in Editor. 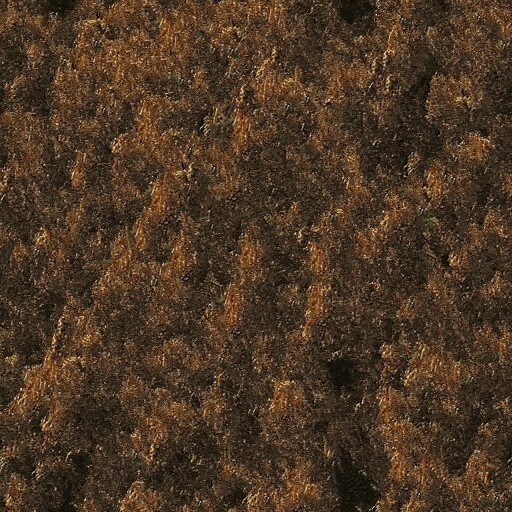 Select your sample moss material that you just cropped from the image. Your sample texture is not seamless, so check the Ignore Borders switch. You can experiment with the ISampler's settings, but i recommend that you use the sample settings like in the image below. Press the Render button and go drinking some coffee ;). The ISampler has a huge computation expenditure and can take several minutes to render the result. Luckily it doesn't require your attention. After the rendering has finished, press the Export button to keep the result. Close the ISampler. This is what the ISampler produced here. The texture is perfectly seamless and doesn't have prominent features that cause visible repetitions if tiled over a large surface. We do the same to get the rock sample texture like we already did to get the moss material. Open the ISampler again, load the rock sample and press the Render button. Go and make some tea, because too much coffee is not healthy. Now we have the rock and moss materials and can proceed to mix them. 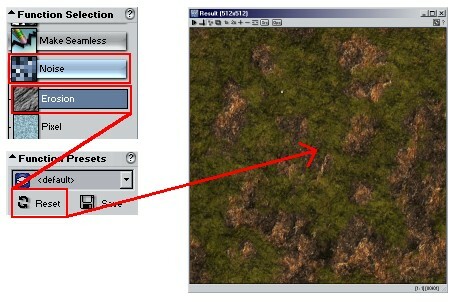 Create a new texture with the same dimensions like the rock and moss textures (e.g. 512x512 like here). Select the function Generator/Perlin Noise and load the default settings. Click on the new, empty texture and the noise will be rendered. To maximize the contrast of the noise, we use the Color/Maximize function. 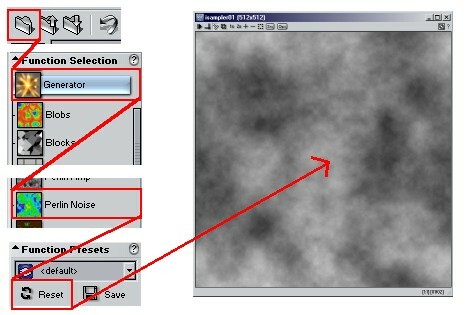 Select it, load the default preset and click on the texture. 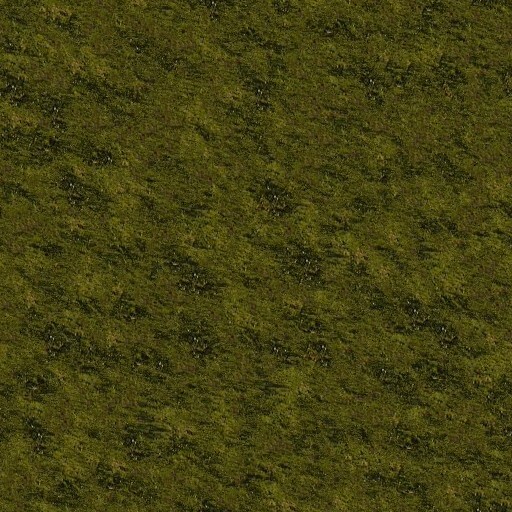 Our Perlin Noise will be the mixing map, that is used to create a combination of the rock and moss materials. Open the Advanced Multi-Texture Mixer. 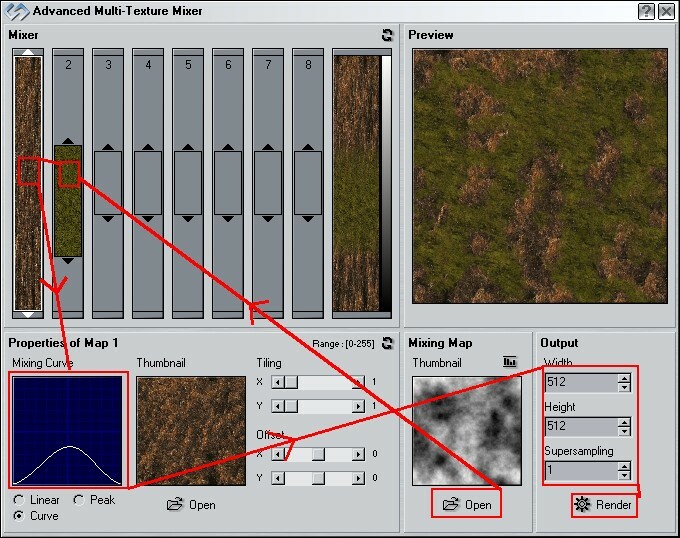 Open the Perlin Noise texture as Mixing Map by clicking on the Open button and selecting Texture from Editor. Load the rock and moss textures by clicking on the two sliders at the left side. Scale the rock slider to full height and lower the amplitude of the Mixing Curve by dragging it down. Move and scale the slider with the moss texture until the preview image looks good. Set the output dimensions to the same values like the mixing map. Press the render button. 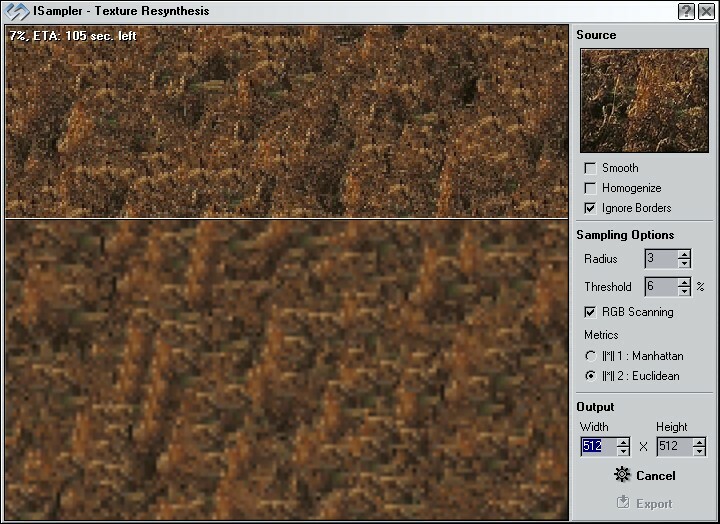 Load the Perlin Noise texture as Height Map and Surface Opacity Map. The texture that was made by the mixer in the last step is loaded as Surface Map and Floor Map. 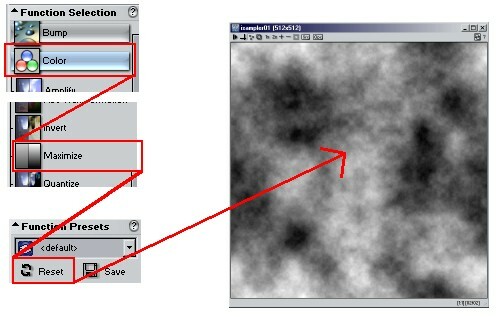 Set the Reflectivity value to zero and make the other values match the ones in the image below. 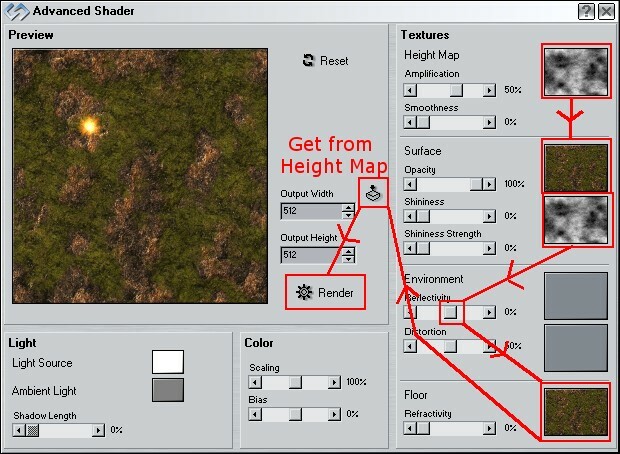 You can set the output width and height values to the ones of the mixing map by clicking on the marked button in the preview section and choosing Height Map. The light source color is RGB(255,255,255) and the ambient light is RGB(128,128,128). Press the Render button. The final step is to add some erosion. 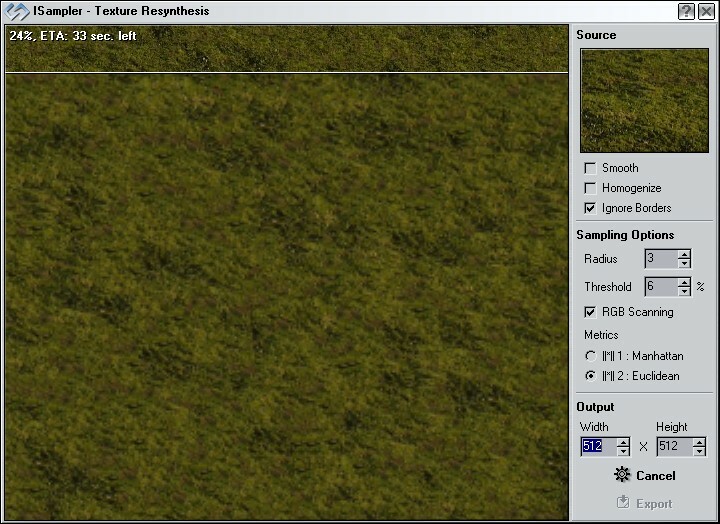 This is done by selecting the Generator/Erosion function, loading the default preset and clicking on the final texture.